Top Five Foods to Avoid « Chef Marcus Samuelsson. After having gone to the doctor yesterday for my three month visit and gotten fairly good feedback, I know I could still do better as far as watching what I eat and serve to my family. This blog post from Marcus Samuelsson could not have come at a better time as it outlines five food types that we should all do our best to avoid if we want to be healthier. I know it’s much easier to say than to do with some of these things, but I am going to make a better effort. Take a look and see if there are things you can cut out to make things better for you and your family! Michelle and I were out and about running errands yesterday in Northern New Jersey and saw a place that seemed like it would be great to have lunch. It is called the Shannon Rose Irish Pub. There are a few of them in Northern New Jersey and it was the first time we had come across it. Since it was lunch time anyway, we figured we would stop in and give it a try. The site in Ramsey, NJ is quite spacious with a very large bar in the center room. We were greeted nicely by a hostess and offered the opportunity to sit outside and eat or dine in. We opted for inside and enjoyed the decor that was around the place. Our server Ryan immediately introduced himself and offered us drinks while we looked over the menu. Michelle opted for a Diet Pepsi (no Diet Coke, to her disappointment) and I decided, since we were in an Irish pub, that I was going to have a Guinness. I noticed that they offered a Black and Tan made with Guinness and their own Shannon Rose Amber Ale, so I decided to give that one a try. our drinks arrived quickly and I have to say the Black and Tan was very good with the right balance of Guinness and ale. The menu itself was plentiful but not overwhelming. There was a great choice of typical pub and bar fare mixed in with some entrees. Many of the dishes offered also include and Irish slant, which is a nice touch. Since we were there for lunch, we opted to go for burgers to keep it simple. Michelle decided to have the Dublin Burger. It is a hamburger with Irish cheddar cheese, Irish bacon, onion and tomato. The thing she loved the most is that you had the option between french fries or tater tots! Of course, she chose to have the tater tots. I went for the Guinness Burger, which was a hamburger with their own specially made Guinness barbecue sauce. It is typically also served with the Irish cheddar, which I opted not to have. I went just for fries myself. The burgers arrived in a very timely fashion and we were very happy with them. 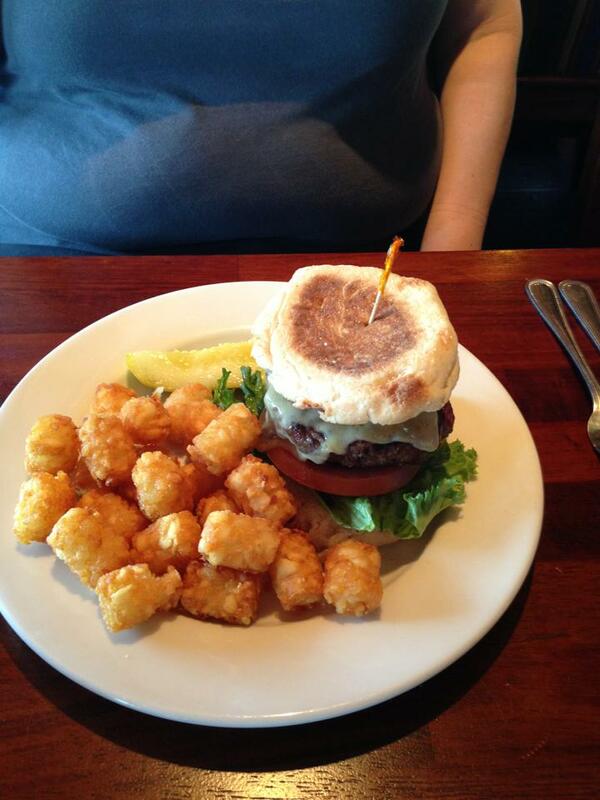 First off, the burgers are served on toasted English muffins, which we both loved. They were cooked to perfection, nice and juicy and medium, just the way we ordered them. The fries I had were also cooked perfectly, not soggy or over cooked, but just right. Michelle loved the tater tots. The burgers were a pretty decent size and very filling (and also served with a nice deli pickle spear on the side). While we would have loved to have room for dessert or another drink, we were both pretty full. Ryan did let us have a look at the dessert menu as a reference for the next time we return. It has some great choices, among them a homemade Irish soda bread pudding, Bailey’s ladyfingers and a Guinness cake. The table just behind us had ordered desserts and they seemed like large portions that looked great, so you could easily share. I would definitely go back to Shannon Rose again. We had a very nice meal, great service and the prices seemed quite reasonable for the drinks and the food. They have live Irish music there often; on every Sunday at 4 PM in fact. They also offer a Sunday brunch that you could check out. It seemed they have a great balance of pub food and dinner food to choose from. I could easily see just sitting at the bar and having a drink or two and hanging out to watch a game or just be with friends. If you live in the area, I would recommend stopping in to check it out. That’s it for today. Michelle and I don’t go out that much so it’s nice to be able to say we went to a place that we enjoyed. Give them a look if you are nearby Ramsey and see how you like it. Until next time, enjoy your day and enjoy your meal! It was hard to resist trying the recipe of the picture on the front cover of the April issue of Bon Appétit magazine. The picture of the fried chicken sandwich that they had on the front looked too good to pass up, so I thought I would give it a try. The recipe itself for the sandwich, the spicy mayonnaise and the Slavic goes with the sandwich were all very easy to prepare. To make the spicy mayonnaise and slaw, mix the garlic, mayonnaise, and hot pepper sauce in a small bowl; cover and chill. Toss the onion, jalapeno, cabbage, pickles, and pickle juice in a large bowl to combine; cover and chill. For the chicken, whisk the flour, pepper, and half teaspoon of salt in a shallow bowl. Pour the buttermilk into another shallow bowl. Working with one piece at a time, dredge the chicken in the flour mixture, shaking off excess. Dip the chicken in the buttermilk, allowing the access to drip back into the bowl. Dredge the chicken again in the flour mixture, shaking off any excess. Pour the oil into a large, heavy skillet to a depth of half-inch. Using a deep-fry thermometer, heat the oil over medium heat until the thermometer registers 350°. Fry the chicken until Golden Brown and cooked through, about three minutes per side. Transfer to a wire rack set inside a baking sheet; season with salt. Spread the cut sides of the roles with butter. Heat and another large skillet over medium heat. Working in batches, cook the roles buttered side down until browned and crisp, about one minute. Spread each role with spicy mayonnaise. Build the sandwiches with the roles, the chicken, and the cabbage slaw. The sandwich itself was awesome. The crispy chicken with the spice from the mayonnaise and the tang of the slaw was a perfect combination. I think if you wanted to cut some fat out you could either use less oil for frying or even try oven-frying the chicken, though it may not come out quite as crispy. For the slaw, I used a bag mix of cole slaw cabbage instead of slicing the cabbage itself. 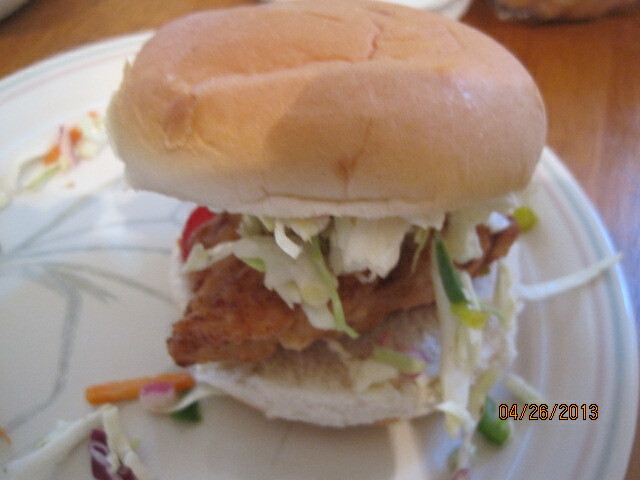 I really liked the way the pickles and jalapeno added great flavor to the slaw and the sandwich. I think you could easily change the recipe around some and not use the mayo if that is what you wanted and go with some mustard or just have the slaw with it instead. I served the sandwiches with some potato salad as a simple side, although Sean opted to have tater tots instead. That’s it for this recipe. I do have another post to put up about a restaurant we ate at this weekend so that one will follow shortly. I also have a few recipes to try this week, including crab cakes with oven fries, a sweet and sour pork stir fry, and another from Bon Appetit that was on the cover of the most recent issue for griddle cakes. Check back this week and see if you like any of them. Until next time, enjoy your day and enjoy your meal! 20 Cookie Recipes That Will Take You Back to Childhood: BA Daily: Bon Appétit. Who doesn’t love a good cookie? Personally, I love when Michelle makes a homemade chocolate chip or oatmeal raisin cookie. There is nothing in the world just like it. Bon Appetit has put together 20 cookie recipes that will bring you back to those when days when Mom or Grandma would pull a tray of cookies out of the oven for you. Check it out and see if you want to try one of your own. For most people, Monday turns out to be the one day of the week where you really don’t want to do any cooking. It’s back to the weekly routine of school, work, after school activities and by the end of the day, you’re too exhausted to even think about having to cook something for dinner. That’s why Monday makes the perfect day to do something like a stir-fry It’s quick, easy and gives you the chance to use either leftovers or any abundance of vegetables that you may have lying around the house. For me, yesterday turned out to be one of those days. I happen to have just a small package of beef in the freezer so it lent itself perfectly to this stir-fry recipe I found at America’s Test Kitchen for stir-fried beef and broccoli with oyster sauce. 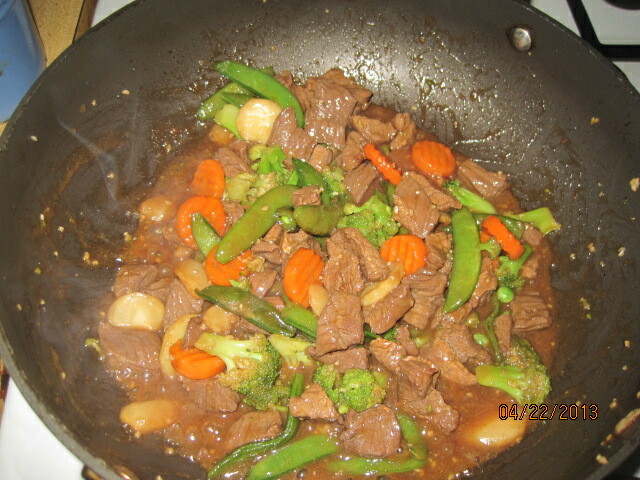 Combined the beef and the soy sauce in a medium bowl; cover with plastic wrap and refrigerate for at least ten minutes or up to one hour, stirring once. Meanwhile, whisk the sherry, chicken broth, oyster sauce, brown sugar, sesame oil, and cornstarch in a measuring cup. Combine the garlic, ginger, and 1 1/2 teaspoons of vegetable oil in a small bowl. Drain the beef and discard the liquid. Heat 1 1/2 teaspoons of vegetable oil in a large nonstick skillet over high heat until smoking. Add half of the beef to the skillet and break up any clumps; cook, without stirring, for one minute, then stir and cook until the beef is browned around the edges, about thirty seconds. Transfer the beef to a medium bowl. Heat 1 1/2 teaspoons of the vegetable oil in a skillet, and repeat with the remaining beef. Add 1 tablespoon of vegetable oil to the now empty skillet; heat until just smoking. Add the broccoli and cook for thirty seconds; and the water, cover the pan, and lower the heat to medium. Steam the broccoli until tender – crisp, about two minutes; transfer to a paper towel – lined plate. Add the remaining 1 1/2 teaspoons of vegetable oil to the skillet; increase the heat to high and heat until just smoking. Add the bell pepper and cook, stirring frequently, until spotty brown, about 1 1/2 minutes. Clear the center of the skillet; add the garlic and ginger to the clearing and cook, mashing the mixture with the spoon, until fragrant, about 15 to 20 seconds, then stir the mixture into the peppers. Return the beef and broccoli to the skillet and toss to combine. Whisk the sauce to recombine, then add it to the skillet; cook, stirring constantly, until the sauce is thickened and evenly distributed over the beef and broccoli, about thirty seconds. Transfer to a serving platter, and sprinkle with scallions and serve. 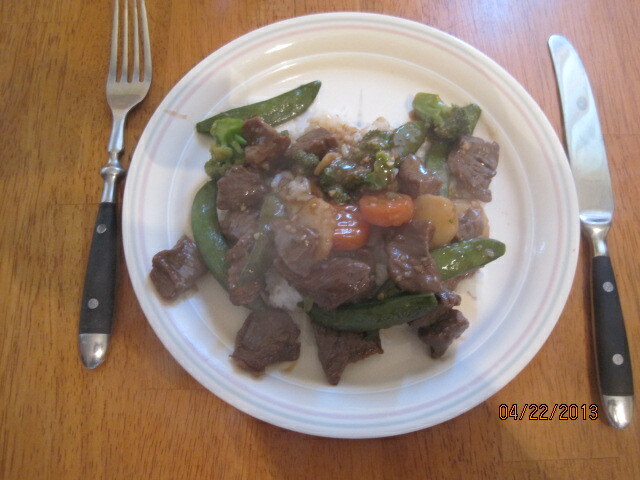 As with most stir-fried dishes, I served this one with white rice. Of course you could easily substitute brown rice for the white if that is what you prefer. Also, I did not have any fresh broccoli on hand; however, I did have a package of mixed frozen vegetables in the freezer which were ideal for a stir-fry I try to keep one of these on hand to make a quick stir-fry whenever we need an easy meal and it worked last night. This bag in particular had broccoli, water chestnuts, snap peas, and carrots. It was a very simple meal, the sauce tasted great and I was all done with the cooking within fifteen minutes. It is a perfect meal for a day on the run. That’s the only recipe for today. Tonight I have the fish tacos planned, which I have posted on here before. If you want to check the recipe for that, you can always check out the previous post I did. I do have a couple of other meals planned for later on in the week, including one for a fried chicken sandwich with spicy slaw and mayonnaise. We are also planning on having some chicken salad sandwiches later on in the week and I am looking to see if there is something new like can do with them or something new and interesting for a side dish. We’ll have to see what I can come up with. Until next time, enjoy the rest of your day and enjoy your meal! I decided to get back to making a regular Sunday dinner and this week as I hadn’t done it a couple of weeks. I had picked up some chicken earlier in the week and a whole chicken makes great Sunday meal. I wanted to find a recipe that would make things a little different and I had seen this one on the Food Network about a week or so ago and thought I would give it a try. It is Garlic Chicken with Israeli Couscous. I had never made it before and it looked good on the TV so we figured what the head lets give it a try. For the garlic chicken: preheat the oven to 350°. Put the garlic bulbs straight on the oven rack and roast them until they are soft when squeezed, about thirty minutes. Remove them from the oven and allow them to cool. Turn the oven up to 375°. While the garlic is roasting, prepare the chicken. In a food processor or bowl, add the lemon zest and juice and set aside. When the garlic bulbs are cool, slice the tops off and squeeze out the roasted garlic into the bowl or food processor along with the thyme, cumin, crushed red pepper and salt to taste. Add a little olive oil and purée or mash into a loose paste. Massage the mixture all over the chicken pieces and allow it to sit for at least one hour. For the couscous: bring a pot of well salted water to a boil over medium heat. Add the couscous and cook until it is about two-thirds of the way cooked through, approximately 5 to 6 minutes. Drain and set aside. Coat a large sauté pan with olive oil and heat over medium high heat. Add the chicken to the pan and brown it on all sides. Remove it to a plate, drain the fat and add the celery and onions. Season with salt and crushed red pepper. Deglaze the pan with the white wine, scraping up all the bits on the bottom of the pan, and cook for 7 to 8 minutes. Stir in the tomato paste and cook for another two minutes. Add in the saffron, zucchini, cooked couscous and chicken stock. Stir well to combine, and then taste and adjust the seasonings if needed. Transfer the mix to a ovenproof dish. Nestle the chicken, skin side up, in the couscous and add some more chicken stock, if needed, to keep things moist and cover the pan with foil. Add some more chicken stock to keep everything moist. Sprinkle with pine nuts, if using, and cover the pan with foil. Place the baking dish on a sheet pan. Roast the chicken for approximately 20 minutes, and then remove the foil and roast for another 10 to 15 minutes. Remove the chicken from the oven and top with this scallions before serving. The chicken came out very moist and had a nice flavor to it because of the garlic paste that was used. I had never made couscous before, so it was little different for me, but I think it came out okay. I don’t think I put enough salt in the water when I was preparing it initially because it tasted like it could use a little more seasoning. Use your best judgment and see what works well for you. I also did not use the pine nuts as they are quite expensive and not something I normally use at all so I just left them out of the recipe. Overall I think it turned out pretty well and if you didn’t want to use couscous I think you could easily substitute white rice or brown rice and this recipe and it would turn out just fine. Earlier in the week, Sean had asked me to get some strawberries and make something for dessert with them. Of course, this time of year the first thing I thought of was strawberry rhubarb pie. 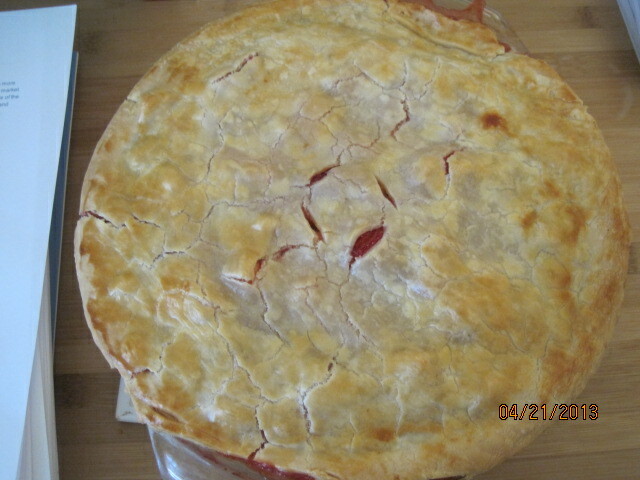 I love the taste of the fresh strawberries with the rhubarb and I hadn’t made this pie before so I had to scour around for a recipe to use. I found one at Williams – Sonoma and I also found one through America’s Test Kitchen. I liked aspects of each one, although the one from America’s Test Kitchen did not include any rhubarb so I sort of combine the two recipes and used the best of both to see how it would come out. For the filling: Select 6 ounces misshapen, underripe or otherwise unattractive strawberries, halving those that are large; you should have about 1 1/2 cups. In a food processor, process the berries until they are a smooth purée, about 20 to 30 seconds, scraping down the sides of the bowl as needed. You should have about 3/4 cup of purée when you are done. Whisk the sugar, cornstarch, pectin, and salt in a medium saucepan. Stir in the berry purée, making sure to scrape the corners of the pan. Cook over medium-high heat, stirring constantly with a heatproof rubber spatula, and bring to a full boil. Boil, scraping the bottom and sides of the pan to prevent scorching, for two minutes to ensure that the cornstarch is fully cooked (the mixture will appear frothy when it first reaches a boil, then will darken and thicken with further cooking). Transfer to a large bowl and stir in the lemon juice. Allow to cool to room temperature. Meanwhile, pick over the remaining strawberries and halve any that are still large. Mix the berries and the rhubarb into the bowl with the glaze and fold gently with a rubber spatula until everything is coated evenly. Place one dough round in the bottom of the pie plate and pat it firmly into the bottom and up the sides of the dish. Transfer the berry mixture to the dough-lined pan. Dot the fruit mixture with the butter. Place the second dough round carefully over the top of the filled pie. Trim the edges neatly, leaving a slight overhang and crimp the edges to seal the pie. Brush the top crust with one lightly beaten egg. Using a small knife, cut five or six slits into the top crust to allow steam to escape during baking. Place the pie in the oven and bake until the crust is golden and the filling is thick and bubbling, approximately 50 to 60 minutes. Transfer to a wire rack and allow the pie to cool completely to set. Serve at room temperature or re-warm in a 350° oven for 10 to 15 minutes just before serving. I think the pie turned out great myself. It was still just a little bit runny but not much. I think using the pectin instead of tapioca did seem to really help, and it gave the strawberry pie a nice strawberry jam-like flavor to it. I think once it has been sitting in the refrigerator overnight it will have set up even more and taste even better. Of course, you want to serve this with fresh whipped cream or ice cream on the side. That’s all there is for today. I do have a few recipes planned out for the week, so we’ll see what we can get to as far as what we want to put up here. I do know I am making fish tacos this week at some point and I have posted a couple of different recipes for them on the air, so it is likely I’ll be using one of those if you want to check out and see what the recipe is like. I do also have a recipe I want to try this week for chicken sandwiches and will have to see what else comes along during the week. Until then, enjoy the rest of your day and enjoy your meal!